This project: 'What can we learn from the systems in place in the higher education sector to support international students with a disability? 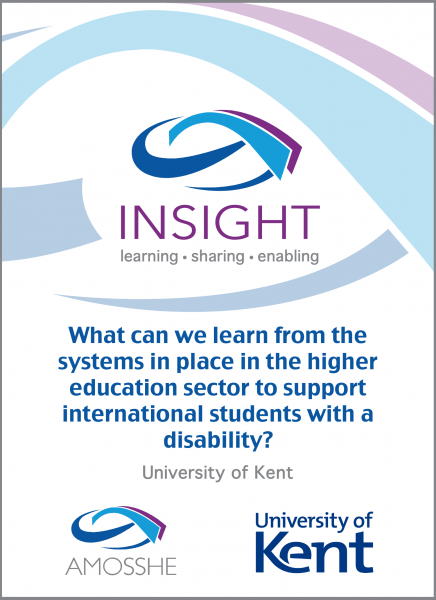 ', undertaken by the University of Kent, aims to broaden the evidence base data about the support provided to international disabled students in the higher education sector. Principal investigator: Dr. Andy Velarde, International Student Adviser. Total award from AMOSSHE: £2,025. Although there has been some research on disability issues in higher education institutions, the state of support provision for disabled international students has had little attention. This project proposal considers that there is a need to evaluate this area of student support. International students have different funding arrangements (mostly private), to support the extra costs associated with their disabilities whilst studying in the UK. Often, there are different models of disability support. For example, their assessment of needs may require harmonisation of different cultural paradigms and (occasionally opposed) medical understanding. Students may access alternative therapists, treatments and equipment, as they are not provided by the national disability or social care system. Conversely, there is information that international disabled students are also exposed to added problems: misconceptions regarding their learning by their host institution, added vulnerabilities in their process of cultural adjustments, and different academic needs based on their complex identities. The current understanding is that higher education providers are providing some support for these students. However, and most importantly, there is no information, other than anecdotal, on how this support is being provided. Many international students come from very contrasting backgrounds, however there is no information about how disability services are dealing with these differences. In addition, there is a need to evaluate the provision of support to international students for institutional reasons. Higher education providers' internationalisation strategies have coincided with the application of disability equality legislation, and have given the higher education sector in the UK an initial competitive advantage. This, combined with a slow pace of development of disability provision in the European Union and the elitist education systems in emerging economies (for example India, Brazil, China), has facilitated higher education providers capitalising on their position in the educational market for accessible education. This advantageous position for higher education providers, however, is not stable, because internationalisation is also making UK institutions vulnerable to international fluctuations (the average proportion of international students in the UK is 15% to 25%). As the UK has an approximate 12% share in the international student market in recruitment terms, and is competing with countries such as Australia, USA and Canada, higher education providers are required to monitor developments in different student support areas, the provision for international disabled students being one of them. This project aims to broaden the evidence base data regarding the support provided to international disabled students in the higher education sector, and to inform policy developments within each institution and within the sector. To establish the extent to which higher education institutions are providing support for international students, to meet the requirements of the Equality Act 2010 and to help them successfully complete their academic studies. To disseminate good practice across the higher education sector. To evaluate the support provided. To report the findings and make recommendations. The methodology to be used is a version of Action Research. This approach uses case studies, and the findings are intended to inform future developments concerning support for international disabled students. analysis of documentation and data. Particular care is required with the handling of disability related data, to comply with the requirements of the Data Protection Act 1998. Assessment of needs and strategies. Auxiliary aids (for example, equipment, hardware / software). Auxiliary services (for example, non-medical helpers). Advisory, administration and monitoring services.